The Clothing Dividers are a must have for every new baby! They make a great Baby Shower gift! These handy plastic dividers make it simple to organize your little one's clothes by size as they grow. As a new parent it is overwhelming with the clothes that you receive and buy before the baby arrives. Our closet divider labels are professionally printed with a glossy finish. The closet rings are a thick white plastic that are durable and easy to place on your closet rod/shelving. Your closet dividers will arrive professionally packaged. Our goal is to bring eye-catching design to your baby’s nursery – creating an easy way to organize your baby's clothing closet through age 24 months. Thank you for shopping with Meraki Printables! 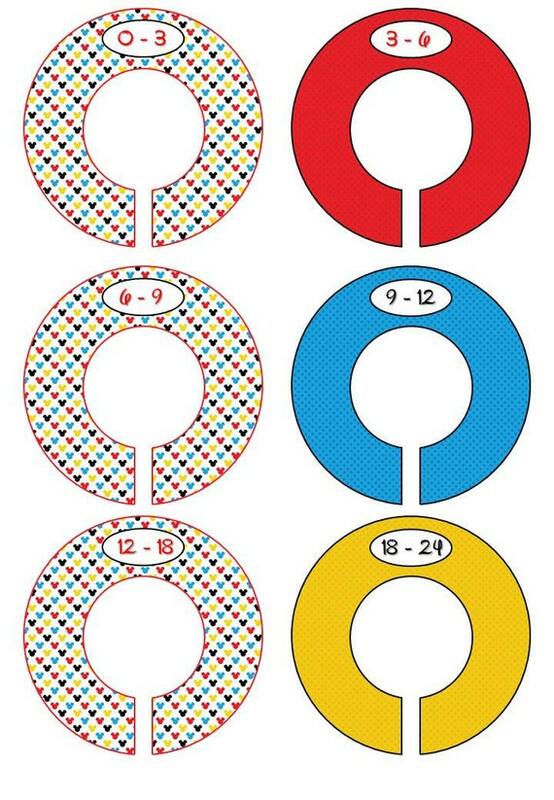 You will receive 6 double sided dividers, completely finished and ready to be placed in your child's closet. Each divider measures 3.5" round. The inside ring is appx. 1 3/8" in diameter. Please make sure these will fit your closet rods before ordering. Additional dividers can be purchased for $2 ea. Each set of dividers comes in cute, professional packaging, perfect for gift giving! Custom: Select "Custom" labels and include your request for each of the 6 dividers in the "Note to seller" box. Color my appear different on your screen then printed. Most printers also have adjustable settings and may print colors a little different. Due to variations in monitors and web viewing devices, the colours shown on your screen may vary from the actual file. Orders that include customization will take 3-5 days to ship - this is because we need time to custom design your items before printing and shipping. Please notify me if you require your item for a specific date and I will do my best to accommodate you. Our products are professionally printed, with the highest quality professionally available, and arrive packaged for gift giving. Because of the expenses incurred in processing your order, we do not offer refunds. If we made a mistake in the item(s) shipped vs. the item(s) ordered, we will work with you to correct our mistake. We are not responsible for lost packages - we provide you with a DHL tracking number or proof of shipment if there is a question about your order. It is my pleasure to do my best to make your buying experience with me is as positive as it can be. However, If for whatever reason you are unhappy with your transaction, I would greatly appreciate you contacting me prior to leaving feedback, so I can find a way to arrange any problem. Please note that you are paying for a creative service and the time spent designing, which is permitted for Personal use. This item is not a licensed product; all character images used are free and not being sold. We do not sell or claim ownership over the character clipart or graphics; they belong to their respective copyright holders. Items purchased are for personal use only and are not to be re-sold for any reason. It is very important to note that copyright restrictions on the Characters only permit graphics to be used for personal use. Our goal is to provide you with a product that exceeds your expectations. Thank you for allowing us to play a part in your special occasions. © Meraki Printables 2017. All rights reserved.